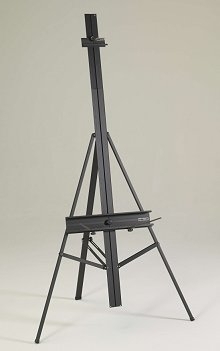 The Torino Gigante Aluminum Easel has been equipped with an unique patented mechanism that enables the easel to be folded up without removing any components, nuts or screws. Torino Gigante is a tripod design that ties the legs together with braces to support large artwork. Virtually no assembly required. Holds a canvas up to 64 inches by any manageable length. Folds easily for portability. Includes the large tray and canvas block. One Year Manufacturers Warranty Included.